I was honored to be a part of the book launch team for the book, It’s All Under Control by Jennifer Dukes Lee. I am a fan of her writing and greatly appreciate her genuine love of Jesus that is so apparent. Plus I can tell that she is truly a fun person! I did receive a BOGO offer on her book as well as a digital copy because of being a part of her book launch. This post is being dated as the same day as her official book release date. At the very end of this post, you can order your own copy using an affiliate link that indirectly supports my writing. There seems to be a theme of many of the books that God is using to speak to me this year. All of the titles seem to be about trusting God in a deeper way. 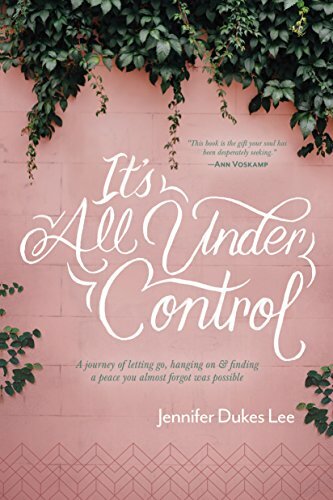 It’s All Under Control: A Journey of Letting Go, Hanging On and Finding a Peace You Almost Forgot was Possible by Jennifer Dukes Lee definitely runs along that theme. The subtitle says it all. To be honest, I found myself crying several times as I read through the pages – both in conviction and in relief. I also think that it is no coincidence that this book was released right about the time that our oldest was turning sixteen. Talk about a release of control! What is possibly not surprising is the fact that chapter six, “Let Go” was the hardest one for me to read and also the one that I needed the most. This quote in particular really resonates with me. My lack of trust in God is the reason I don’t let go of what I want. Ouch. But oh so true. God has pushed my faith to the limit the last several months. And He has come through over and over and over again. I am grateful that He is willing to continue to transform my mustard seed faith into something greater. Not surprisingly, It’s All Under Control by Jennifer Dukes Lee is another book that I will read again and again. If you would also like to own this book (and I think you should! ), please purchase the book using the below link. This supports my writing work indirectly. Thank you!